Ayers Legends German Shepherds is family owned and operated out of Southern Oklahoma. Where we take pride in preserving the old fashion German Shepherd. For our family it is a passion to breed a German Shepherd that is Superior to any other G.S.D you’ll find out there, while keeping Health & Temperament as our key focus but maintaining the integrity of what the Old Fashion G.S.D use to be. Without Health being 1st, nothing else really matters! 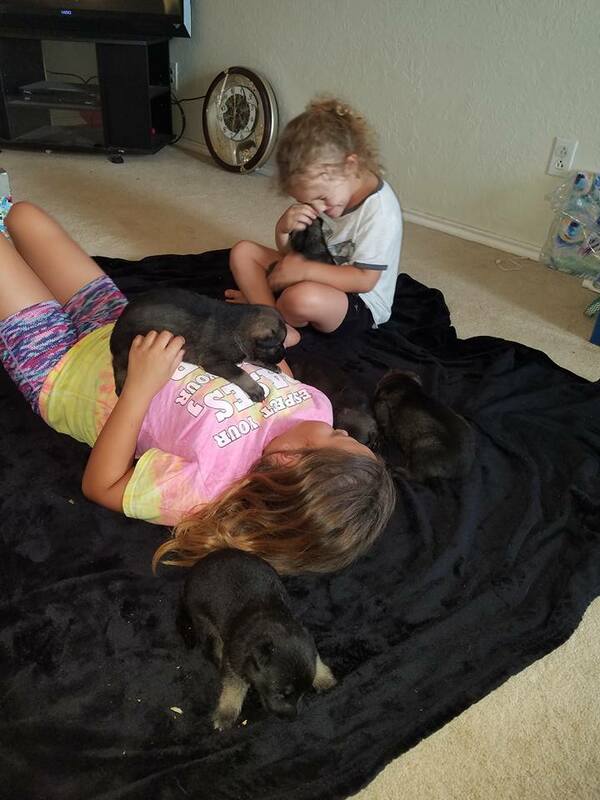 From day 1 our pups are handled on a daily basis by our kids and by us. This helps them get a jump start in life by stimulating the neurological system, it helps develop a strong cardio system and helps make a pup that is ready to be a great family companion for adults & kids. Our lines have very stable temperaments that are suitable for families but also can excel at jobs such as Search and Resuce, Therapy work or are often achieve Titles with the owners. At Ayers Legends German Shepherds we have years of knowledge that we continually pass down to our customers, to ensure they have a proper roadmap for success to a healthy pup that will have many years to come! We also have a Facebook group that is for customers only. It is the Ayers Legends Family page . Once you get a G.S.D from us you become a part of our big , extended family. We make video’s quite often that we post on the page to help guide and assist to answer any questions that our customers might have. We post video’s that cover subjects such as Vaccinations, Spaying and Neutering, Nutrition – what to feed and what not to feed, How to properly aid in healthy growth for a young pup, Etc. We have a true passion for what we do and are always there for our customers to provide and pass on our knowledge in ways that many other breeders don’t do. With Ayers Legends you will get continued education through out the years with your new family member.